Good morning! I hope you're having a great week so far. 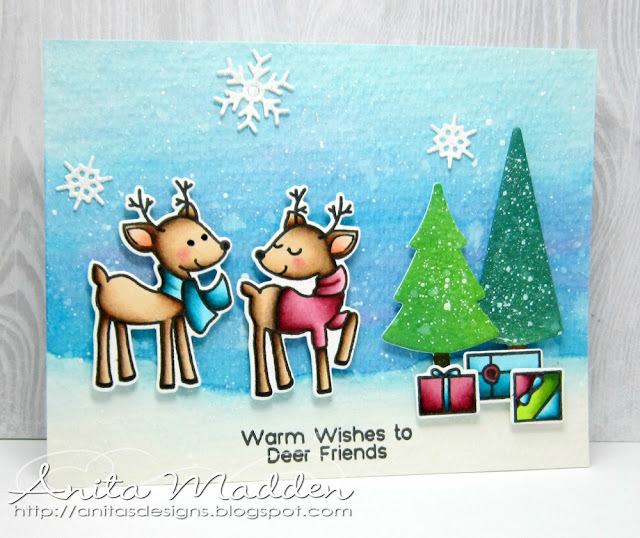 Today I'm sharing a Christmas card I made using some stamps and dies from The Greeting Farm. These adorable images are from the Dashing stamp set. I love the reindeer in this set - they are so cute! I cut a panel of watercolor paper and painted the sky and snow using distress inks. I spattered some water and dried the panel, then spattered some white acrylic paint. I also used distress inks to watercolor the trees and spattered them with paint. The deer and gifts were all stamped on Neenah and colored with copics. I used the coordinating Dashing die cuts to cut out all the images. I used a black glaze pen on the deer's eyes and then adhered the images with foam tape. I added a few diecut snowflakes that I coated with Glamour Dust. Cute little scene and stellar colouring! Love your card! I agree the reindeer are too cute!